October 9, 2012: As part of a nationwide movement, 11 Walmart associates walked off the job today in Laurel, Md., backed by strong support from the community and members of the United Food & Commercial Workers (UFCW) union. 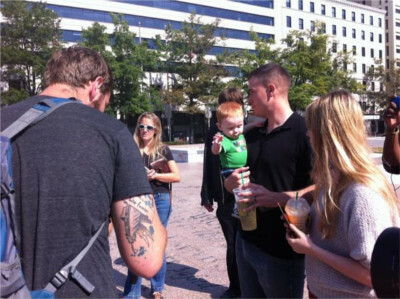 Micah Turner announced on October 6, 2012 at an Occupy DC rally on Freedom Plaza trhat he has defected from the US Army, having been AWOL for weeks. After giving a 25 minute interview, he immediatly left the area, well ahead of any reaction team.